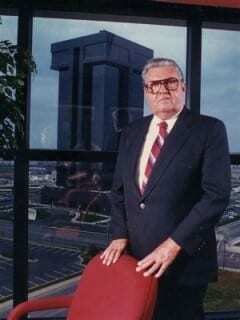 One of the great hoteliers/developers of our time, John Q. Hammons developed 200 hotel properties in 40 states. But mere statistics hide the essence of Mr. Hammons special development techniques. He disdained the standard feasibility studies when assessing potential sites for hotel development and instead relied on his own experience, knowledge and intuition. Hammons began his development career by building housing for World War II veterans in Springfield, Missouri. When the city planning commission refused to approve a high-end shopping center, Hammons traveled to California where he saw Del Webb’s Highway Houses: a pioneering motor hotel concept that followed Route 66. When Hammons returned home, he contacted an unknown Memphis, Tenn. builder named Kemmons Wilson who was undertaking a similar concept named Holiday Inns. Hammons formed a partnership with a plumbing contractor Roy E. Winegardner and in 1958 became one of Holiday Inn’s first franchisees. During their partnership, Winegardner & Hammons developed 67 Holiday Inns, about 10% of the total system. This development coincided with the creation of the Interstate Highway System when President Dwight D. Eisenhower signed the Federal-Aid Highway Act of 1956: a 13-year plan that would cost $25 billion, funded 90 percent by the federal government.